The 1975 Inter-American Convention on International Commercial Arbitration, also known as the “Panama Convention“, is a significant multilateral agreement of which not all in the arbitration community are aware. The Convention was open to signature by all 35 Members of the Organization of American States (OAS) and entered into force on 16 June 1976. This multilateral agreement regulates the conduct of international commercial arbitration and the enforcement of arbitral awards. 19 countries have signed and ratified the Convention to date, and a full list of the State parties is available below. 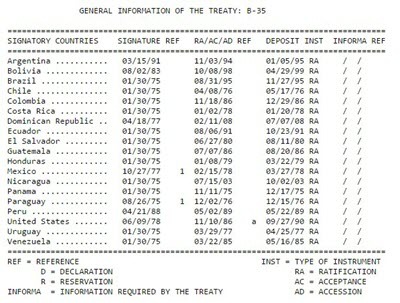 It is interesting to note that one of the signatories is the United States, which signed the Convention in 1978 and ratified the Convention with three reservations in 1986. What is particularly interesting about the Inter-American Convention on International Commercial is the issue of enforcement and its relationship with 1958 New York Convention on the Recognition and Enforcement of Foreign Arbitral Awards (The New York Convention). Both Conventions govern the same issues and both have been signed and ratified by a number of States in the Americas. Despite providing for identical or similar solutions for certain issues, such as the grounds on which recognition and enforcement may be refused, a legitimate question has been raised regarding which of the two international agreements prevails and how potential conflicts may be resolved. One way to solve the potential conflict could be the well-known principle lex posteriori derogat legi priori, meaning that the later law repeals the former one, or the lex specialis principle, which means that the law governing a specific subject matter overrides a law that governs a general subject matter. However, these theoretical solutions were insufficient to solve the conflict, which is why certain countries decided to specify in their national arbitration laws which enforcement regime is more favourable. One example is Panama’s Arbitration law no 131 of 2013. The Panama Convention has created some confusion in the United States. Both US Federal Courts and the Congress have determined that the Panama Convention takes precedence over the New York Convention, however, courts frequently steer away from the Convention and prefer the New York Convention or Federal Arbitration Act (FAA) to resolve enforcement issues. The trend seems to suggest that United States courts will continue to treat the Inter-American Convention on International Commercial Arbitration merely as an extension of the New York Convention, despite its small differences. The full text of the Inter-American Convention on International Commercial Arbitration is provided below.